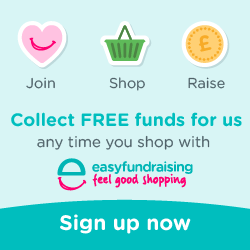 So, you’ve noticed the easy fundraising link on the home page – but what is it?!? It’s simple really, it raises funds for DIBCA without costing you anything at all. Simply by clicking the site and then following the links to the retailers listed, you can donate a small % of your purchase price to DIBCA. You DON”T pay anymore, the retailer takes slightly less thats all! So before you buy online, click on the link on the home page and check to see if where your buying from is listed.